The Outer Bank at Stonehenge is almost worn away and author Raymond Capt said it has a diameter of some 380 feet, but geometric design analysis in several ways refines it to exactly 380.16 feet diameter which is very significant whereas 380 feet diameter is meaningless as are any other estimates in the near vicinity. The Station Stone Rectangle indicates in different ways the exact diameter and circumference of the Outer Bank for example the rectangle’s length + breadth produces the 380.16 feet diameter of the Outer Bank. 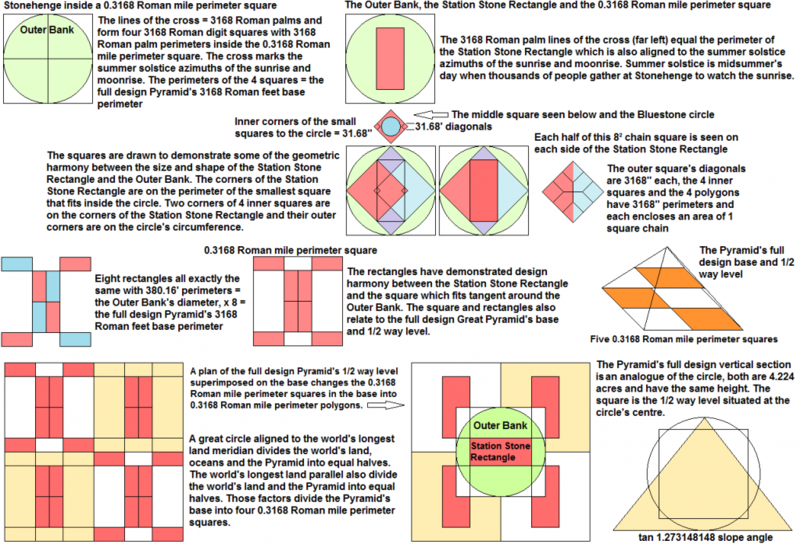 We have introduced a 0.3168 Roman mile circumference circle to the 0.3168 Roman mile perimeter square via the Great Pyramid and now we will see how the circle and square relate to Stonehenge’s design. In the first illustration below the triangle is formed by drawing tan 0.44 lines (the angle of the Station Stone Rectangle’s diagonals) from the left side corners of the 0.3168 Roman mile perimeter square, the lines meet each other on the circumference of the 0.3168 Roman mile circumference circle, this is repeated on each side of the square to produce the designs below. An eight pointed star is produced and the 4 points that pierce the circle are contained by the square and the 4 points that pierce the square are contained by the circle. 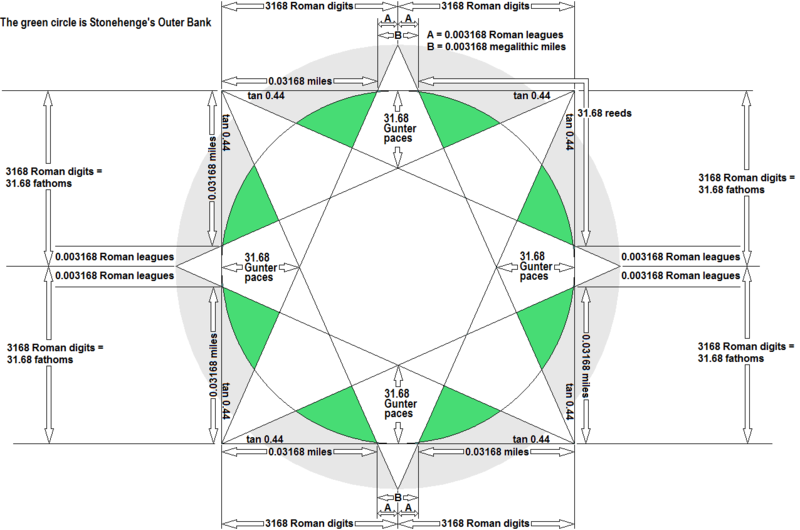 The 8 pointed star is exactly 483.84 feet wide and 483.84 feet high and 483.84 feet x 22/7 = 1520.64 feet or 0.3168 Roman miles so the 4 points of the star that protrude 864/275 rods beyond the 0.3168 Roman mile perimeter square fit tangent inside a 0.3168 Roman mile circumference circle. The 0.3168 Roman mile circumference circle symbolized above by the Pyramid’s vertical section has a 484 feet diameter and 484 feet x 864/275 = 0.3168 Roman miles circumference. 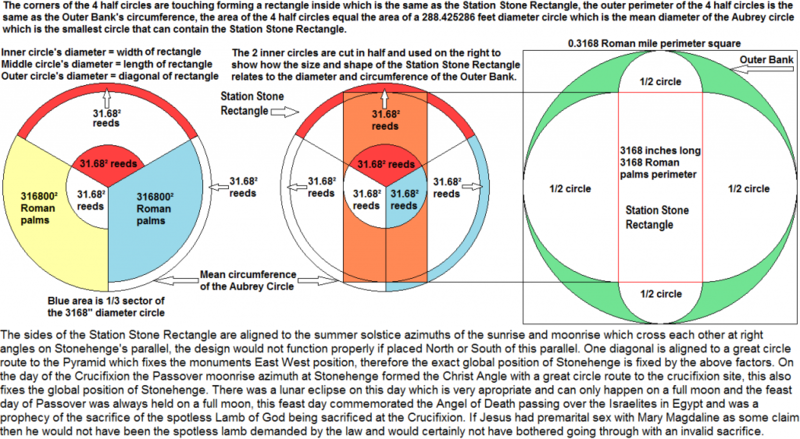 If we assign the line of the Stonehenge’s circle a thickness of 1 Roman inch and the inner circumference via 22/7 = 0.3168 Roman miles then the outer circumference via 864/275 would also be 0.3168 Roman miles which brings those circle and square features of the two monuments into perfect harmony. This is an interesting rectification factor using the Roman inch, the 0.3168 Roman mile Prime Measure of this investigation and the 22/7 with the 864/275 methods for pi. Notice how the 1/2 circles on the right instantly reveal the design harmony between the size and shape of the Station Stone Rectangle and the Outer Bank’s outer circumference demonstrating that the outer diameter has to be exactly 380.16 feet or the harmony would not exist.